Harvard Business School is ready to dive into the waters of online learning. The institution will soon begin enrollment in the first set of courses to be offered on HBX, a new e-learning platform the school has been quietly developing over the past year and a half. First reported by Bloomberg last October, HBX is a "digital learning initiative aimed at broadening the reach and deepening the impact of HBS's research and teaching," said Dean Nitin Nohria in a recent e-mail sent to members of the HBS community. 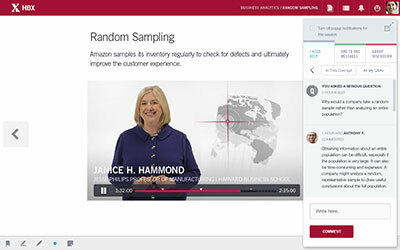 While HBX uses technologies that complement Harvard and MIT's edX venture and other MOOC platforms, it is a separate entity customized for the business school's instructional approach. Nohria explained that a combination of factors has influenced HBS's decision to enter the online realm: "Technology and the web have matured significantly. Students increasingly are digital learners. Our own portfolio of programs — MBA, Doctoral and Executive Education — has deepened and evolved, and our means for managing and disseminating information, including Baker Library and Harvard Business Publishing, have grown in reach and impact. In sum, we felt we might innovate from a position of remarkable strength." "HBX must expand the reach of Harvard Business School and our mission of educating leaders who make a difference in the world. We must think strategically about well-defined student segments where we see potential for significant impact. "HBX must provide faculty with a powerful platform for disseminating their ideas globally. "HBX must complement and enhance our on-campus offerings. Our residential programs are among the most treasured academic experiences in the world, and we should not dilute the integrity of those experiences — rather, we should try to strengthen them. "HBX must elevate our reputation for excellence and impact. We must pick our spots carefully, looking for places where we can create sustained, differentiated value for individuals and organizations. Our commitment is to do no less than transform. "HBX offerings must be highly differentiated from existing alternatives. Our challenge is to establish a standard for excellence in online business education and pedagogy, just as we have established the standard for excellence in our case method classrooms. "HBX must be built on a robust and forward-looking economic model. While HBX should make business education more accessible, including financially, it also must be economically sustainable to enable future investment and growth." The first offering on the HBX platform, called CORe (for Credential of Readiness), will consist of three courses on business fundamentals — Business Analytics, Economics for Managers, and Financial Accounting — designed for undergraduate students, graduate students in non-business fields and people just starting business careers. The courses are not offered for college credit, but students who go through the program and pass a final exam administered at a physical facility will receive a credential certifying their completion. HBS will also keep student transcripts on file so that they can be shared with prospective employers or education institutions. The courses have been conceived as an online counterpart to the on-campus HBS experience, said Nohria: "CORe will be participant-centered, problem-based, and require active learning. Most important, CORe will be rigorous, designed for serious and committed learners: students will be assessed not only on their mastery of course content but also on their participation." "The HBX faculty team has thought carefully about how to create an online offering that mirrors the energy you find in an HBS classroom and that allows students to benefit from the diversity and experiences of other students," noted HBS Professor Bharat Anand, faculty chair of HBX, in a press release. Following the HBS learning model, HBX will incorporate real-word case studies, interactive tools and a "cold call" feature where students must answer questions on the spot while their peers rate their response. CORe will initially be limited to juniors and seniors from colleges and universities in Massachusetts. Applications will be available in April for a June program start. The fee for the program will be $1,500 per student; need-based financial aid is available. CORe will be opened up to a wider audience later in the year. Also in the works is an array of courses called HBX Ideas, designed to showcase faculty research and ideas to a broader population. Launching in late spring, these courses will cover topics such as entrepreneurship and innovation; the microeconomics of competitiveness; and disruptive innovation, growth and strategy. And this summer, HBS will introduce HBX Live, a virtual classroom that allows remote participants to interact directly with one another. HBS partnered with public broadcasting company WGBH to create the space, which can accommodate up to 60 participants at a time. HBX Live will initially be available on an invitation-only basis; its focus will include the school's modular Executive Education programs as well as learning events for HBS alumni.